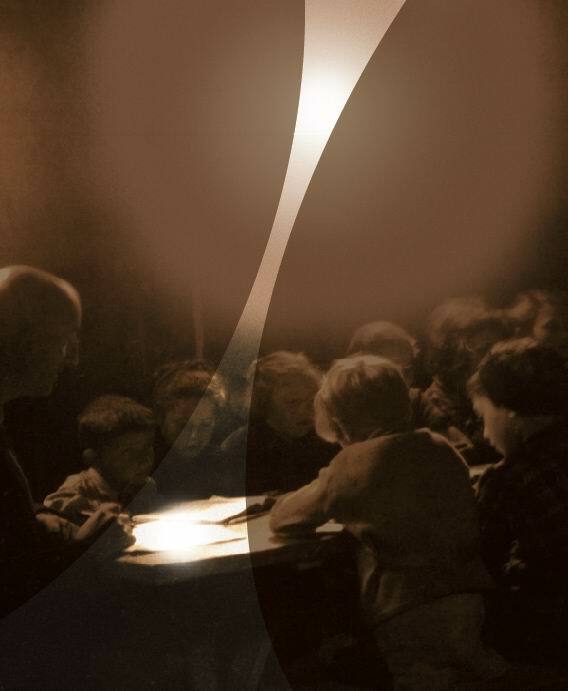 both before the war and in the wartime Ghetto Stories of hope: a secret school operated inside the Kovno Ghetto, while brave and defiant Ronia Rosenthal sought foster mothers outside the ghetto, and the stories of two of the babies she rescued. Click on the flag in top left corner to return to index page of Jewish History Australia. In Jewish culture there is always a supreme effort to protect children and to spread joy and hope via music and poetry even in the darkest time. 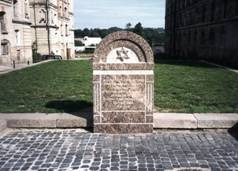 In the Theresienstadt "camp-ghetto", where actual teaching was permitted, the adults laboured despite hunger and the everyday threat of death to give their children the broadest possible education, including much art and music. Thus it was that the genius of Peter Ginz was cultivated until he was sent to his death in Auschwitz. It is pertinent to compare this love of life and fulfilment of the Jewish people with the behaviour of interned asylum seekers in Australia, who were well fed, safe and secure but confined. In June 2002, asylum seekers detained in the Woomera detention Centre allowed themselves and their children to become so angry and despondent that they sewed their lips up for publicity, and highlighted depression, while some threatened suicide. No attempt was made to shield their children or lift their spirits, some children also had their lips sewed up by their parents, . The children were used as pawns, against the values of a Judaeo-Christian society. The essential point is that the culture of the Jews is a creative one. Here is a story with a striking Australian link of how Jews created hope and held to their values amidst the daily horrors of the Holocaust. 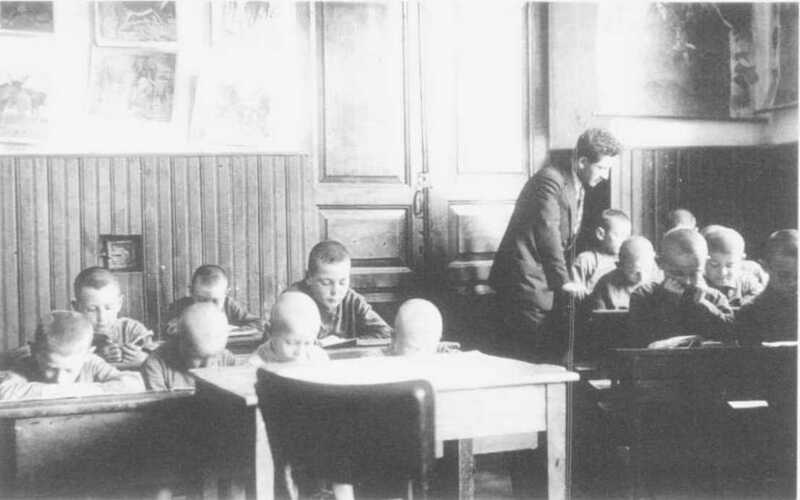 A classroom for orphans in the Jewish Children's home in pre-War Kovno. 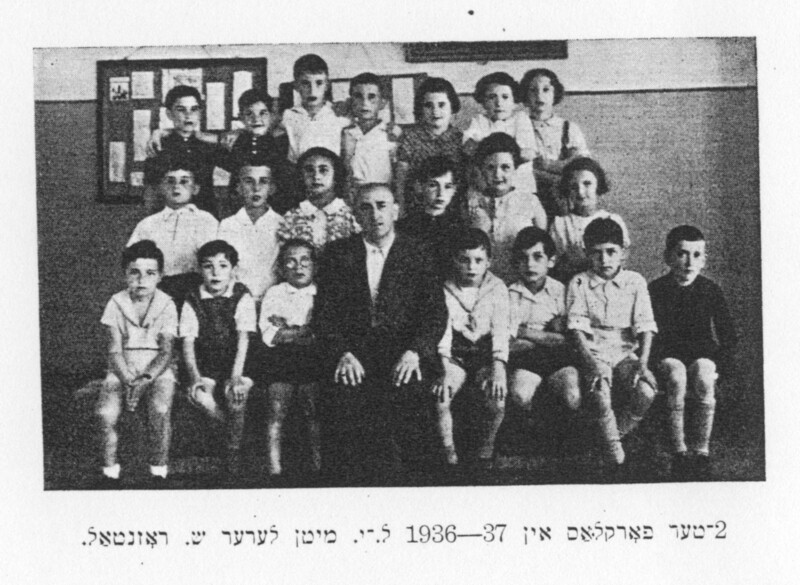 Teacher Mr Shmuel Rosenthal and his primary school class 1936-7. Rosenthal was active in the Kovno Ghetto resistance. In Kovno before 1939 there were secular Jewish schools, teaching in Yiddish, as well as Cheder catering for the more orthodox. After the takeover of Lithuania by the USSR, all cheders were closed, but the secular schools continued. 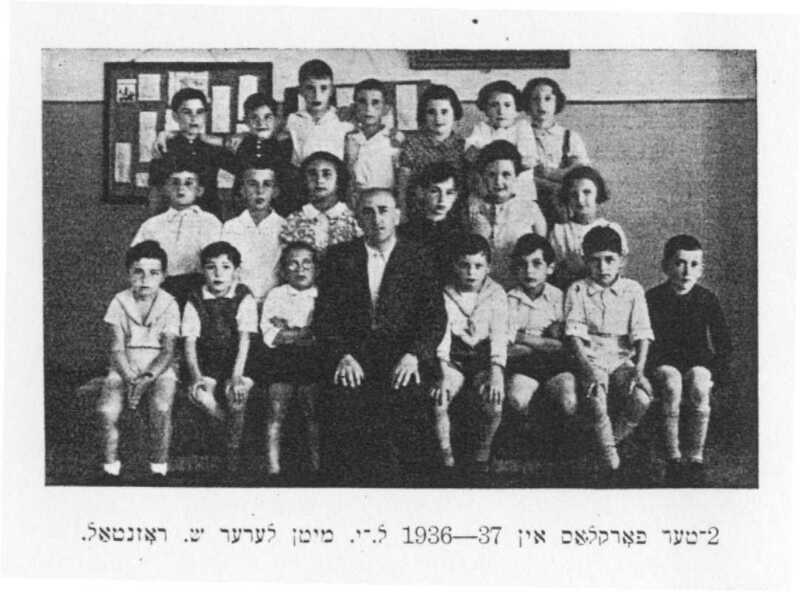 Yiddish caption to this pix of teachers at the Jewish schools in Kovno pre-War. 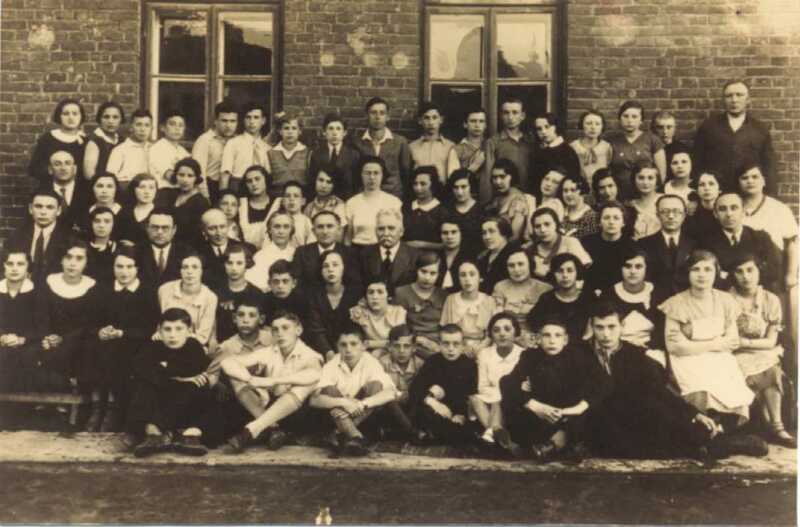 Teachers and trainee teachers in a Jewish school in Kovno pre-War. Kovno teachers on a picnic. Shmuel Rosenthal standing. 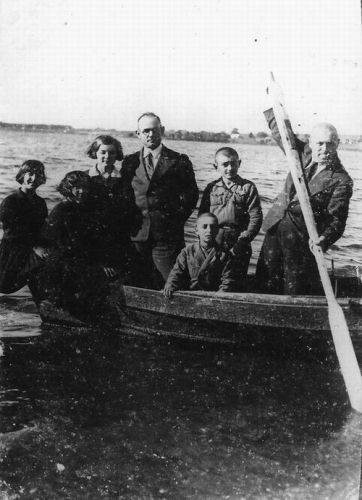 After the German invasion, Jewish residents of Kovno were confined within a Ghetto. For a little while the Judenrat conducted schools within the ghetto perimeter, using the available teachers. After the Germans closed the Ghetto schools in August 1942 secret classes were conducted in various hidden locations inside the ghetto. 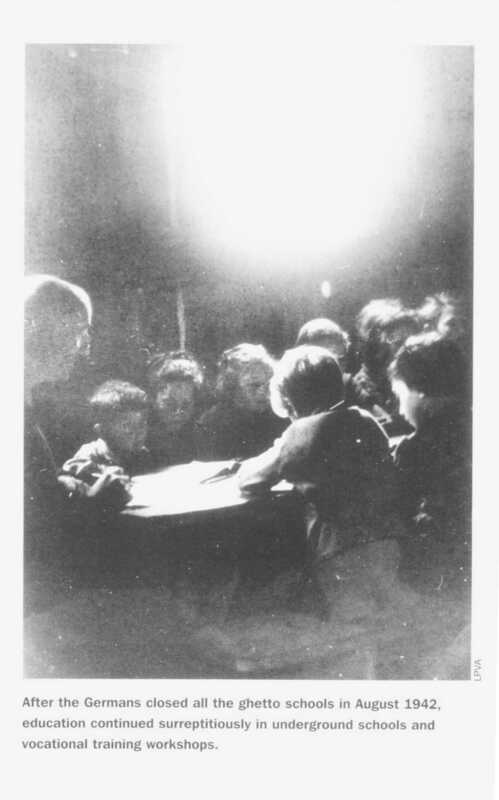 The photograph to the left is of a class conducted in the "underground school" -- actually in stables -- by Shmuel Rosenthal , who appears in the pre-War images above. All these "illegal" schools ceased after the removal of over two thousand ghetto children during the "KinderAktion" 27-28th of March 1944. The teacher Shmuel Rosent(h)al - survived -- as did -- miraculously -- his daughter Rona born in secret and smuggled out of the ghetto as a tiny baby. His wife, Ronia, the baby's mother, did not survive. After the war Shmuel Rosenthal once more taught in and supervised Jewish schools, until circa 1949 when Jewish education was once more made illegal by the Lithuanian Communist government. Rona who was re-united with her father after the war, was then thrust into a Lithuanian language school. In 1979 Rona came from Lithuania to live in Melbourne. Sketch of Shmuel Rosenthal in Dachau shortly before liberation. Artist unknown. Refined image which was used by the Jewish Community Council of Victoria in flyers for the 2009 Yom Hashoa Commemoration Service. 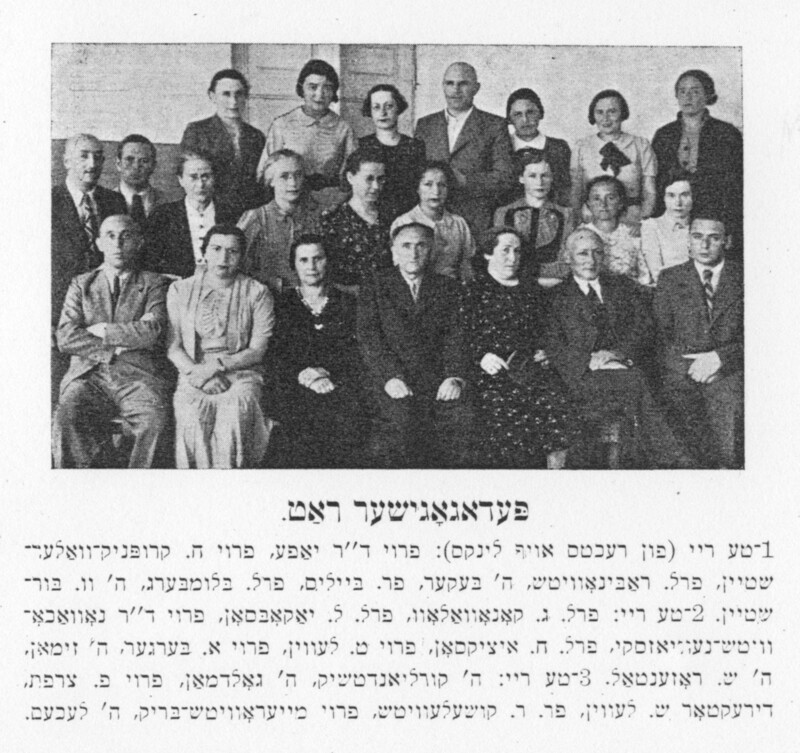 Before the war, Ronia Rosenthal, the wife of Shmuel Rosenthal, educated in Brussels, had run a college in Kovno devoted to the Steiner Method (for teaching young children). She herself also did some teaching in Sholem Aleichem College. Thus she had many ex-students in the wider community, including nuns, who were pre-school and kindergarten teachers. Once the Ghetto had been established, at great risk to herself, Ronia would travel outside the Ghetto, recruit foster mothers, and make arrangements for the transfer of babies and (tiny) todlers to the foster mothers. In order to disguise her activity outside the ghetto, Ronia Rosenthal, bleached her hair, and removed the Jewish Star from her coat. As she had studied in Brussels, her speech would not give her away. In early 1943 she herself became pregnant, and her own child (later named Rona) was, when eleven months old, smuggled out. Before the ghetto's liquidation a bribe was paid to secure Ronia's own escape from the Ghetto, but as so often happened with extorted bribes it was not honoured. Her husband, leading teacher Shmuel Rosenthal, was transported to Dachau, but managed to survive. In the case of one tiny todler -- three attempts had to be made to smuggle the wrapped up drugged child out of the ghetto. A package containing a drugged child was left in a pick up spot for collection over three nights in a row. The small nondescript package was placed at a spot against the ghetto fence reachable from outside. But on the first two nights ghetto guards were loitering nearby. The child's mother was most distraught -- as she feared that her child might suffer serious damage by repeated sedation. When he was collected on the third attempt and taken to his foster mother the child, about 15 months old, avoided certain death in a Kinder Aktion. This baby rescue took place in October 1941, when children were still permitted in the Kovno Ghetto. This child was especially fortunate in that he was re-united with both of his parents after the war. Now living in Austria, he is Prof.Dr.Julius Neumark, a medical specialist with an academic teaching role. 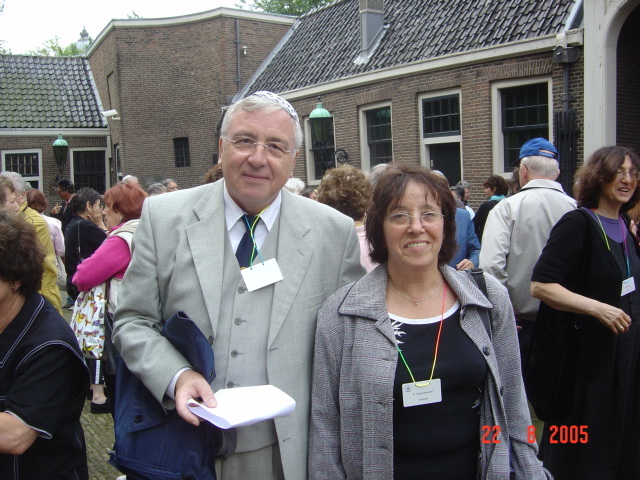 Two rescued Kovno babies meet in Amsterdam At a meeting of child survivors held in Amsterdam 2005 Rona Zinger lit one of the six candles signifying the death of six million Jews in the Holocaust, and told her own story. One of those present Julius Neumark was amazed; Rona's story was his story. He too had been smuggled out of the Kovno Ghetto as a tiny toddler. Julius was most fortunate that both his parents survived the War, and Julius was re-united with them almost immediately afterwards. Rona's mother had not survived, and Rona was not re-united with her father until 1946. Rona was born in the Kovno Ghetto when such births were "verboten" according to a German order of July 24, 1942. Rona's mother was Ronia Rosenthal, the baby rescue activist, who found willing foster parents out side the Ghetto for an unknown number of babies within the ghetto. Her father was Shmuel Rosenthal, a teacher in the Ghetto, who taught in the Underground School of the Ghetto. In October 1943 the eleven months old Rona was drugged so that she would not cry or scream, and placed at the very edge of the ghetto, at a pre-arranged spot. 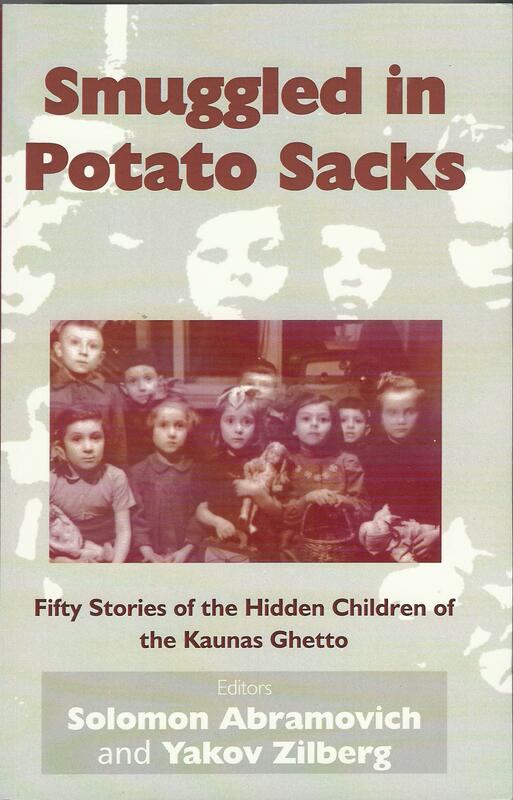 In the racially hostile Lithuanian society, Rona, and her foster mother were in danger. Rona thrived with her wondrous foster mother. her father who had survived the war but did not immediately return to Kovno when the War ended - and was presumed to be dead. It was an extreme wrench for the young Rona when she was suddenly re-united with her father in 1946 At that stage her father was a school director for Jewish (secular) Schools in Lithuania. 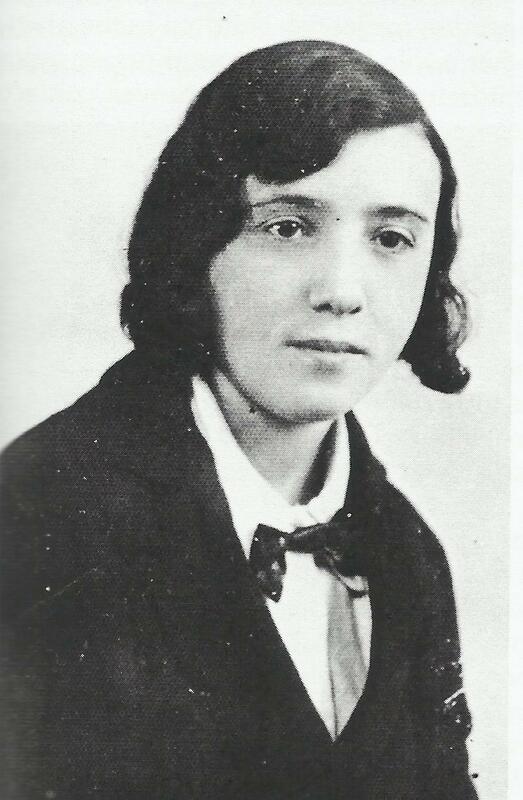 Rona commenced her school education in Yiddish. But when Stalin's antisemitic policies were fully applied in Lithuania, Jewish Schools (teaching in Yiddish) were closed, and Rona was thrust overnight into a Lithuanian language school. The closure of all Jewish schools in Lithuania meant that Rona's father lost his job, and in fact thenceforth he could only find employment in unskilled roles. Rona was a most successful student, attending university, becoming a computer programmer. She married fellow Lithuanian Naum Zinger and has two children. Her husband's parents from Klyperda on the Baltic side of Lithuania had escaped into Russia at the earliest stage of the war, when Klyperda was made part of Prussia. His father served in the 15th ( Lithuanian ) Division of the Russian army -- which was almost exclusively Jewish. .
A fictional version of Rona's life story called Das Ghettokind [The Ghetto Child] has been written in German by noted novellist Erika Fischer. The compilation of Holocaust stories is called Die Liebe der Lena-Goldnadel Zehn Judische Geschichten [The love of the Lena gold needle -- Jewish stories], published by Rowohlt, Berlin, 2000. On the 27th March 1944, while the Kinder Aktion in the Kovno Ghetto was under way - there was a much smaller Kinder Aktion in Vilnius. This Aktion took place in the HKP labour camp on Subocz Street; the actual Vilna Ghetto had been "liquidated" in 1943. The 250 children removed from the HKP Camp on March 27 were murdered at Poneiri (Ponary), on the outskirts of Vilnius. Picture to the left is the memorial in Vilnius to the HKP slave labour camp. These two books are must reads!! 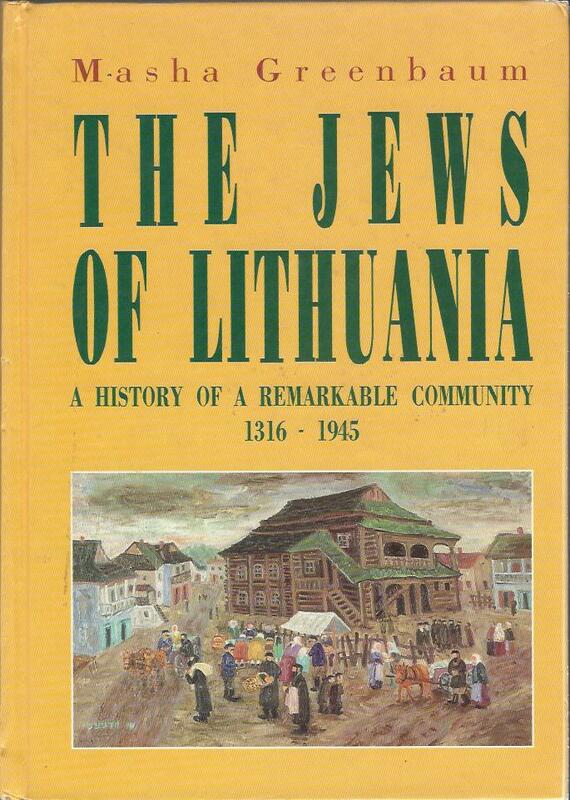 This page is devoted to a story of the Lithuanian Holocaust that has to be told. It is both a story of both courage and bastardy within scenes of the utmost horror. The courage of Ronia Rosenthal and the Lithuanian foster mothers who saved Jewish babies from Kovno from certain death. The teachers of the Underground school of Kovno -- who sought to give their students a touch of hope. The bastardry of the LAF who in conjuction with the Germans slaughtered so many. Although long ago this story has reverberations in contemporary history: to follow-up click on The History Of Now Logo opposite. Especially crucial has been a recent attempt in the Baltic states to obfuscate the Holocaust.